I carry far too much equipment around with me on a regular basis and really want to cut down, now the most important kit is the camera equipment, the least used is the laptop. 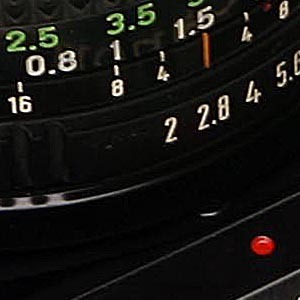 The camera will shoot for hours but the edited down images are usually transmitted in a matter of minutes. So lugging a 6lb laptop, plus charger, plus Datacard and CF card reader and other ancillaries is a real pain. Even though many companies have tried to design camera bags to accommodate laptops, they invariably forget the stuff that goes with them. Welcome to a new dawn. Instead of having a bag, that fits your computer, how about a computer that fits whatever bag you already have, hey why not a jacket pocket, or a belt pouch. With the modern processors and cheaply available memory, Pocket PCs have come of age for the trendy man about town. Now with Idruna’s Pocket Phojo version 3 is the Pocket PC is now also useable as a replacement for the laptop. Phojo supports Bluetooth connections to mobile phones, and in-turn supports GPRS (57kbps) GSM 9600 and 1800, 3G (up to 384kbps), WiFi (most PDAs only support 802.11b at present) R-BGANS (Sat-Phones), Land Line Modems and Ethernet Connections (with the last two you will need either USB or CF card adaptors) So wiring from anywhere in the world shouldn’t be a problem. Need to use a Internet Cafe in Spain, that doesn’t have WiFi use an ethernet CF card. Only have a landline available then a CF v90 modem might fit the need. So in a pouch a little larger than a Point and Shoot camera you can have, full wiring ability from anywhere in the world, over almost any imaginable medium, So in reality how does it stand up. Phojo is the first handheld photo editing and wireless transmission solution for photojournalists, who can now fit all of the tools they need in their pocket. From Idruna Software Inc. I was skeptical when a couple of colleagues had been discussing the merits of a pocket PC, I knew a couple of people that had them, and they crashed all the time, were very slow and the screen resolution was nothing exceptional. 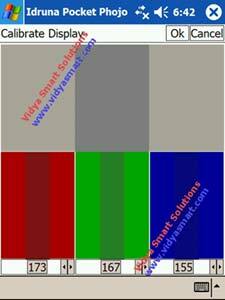 (Trust me there is more to screen resolution than just pixel counts, but it does help to have more). 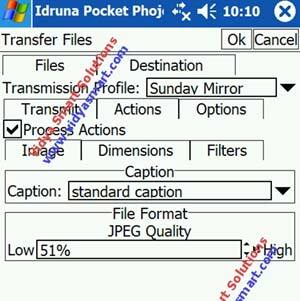 So, a quick email to the very approachable Paul Nolan the Chief Executive Officer at Idruna Software and I was promised an evaluation copy of the Pocket Phojo. So all I had to do was find a suitable Pocket PC. A number of suggestions were made including the HP 4700 and the Loox 700. As the Loox has considerably more memory than just about any other PDA and a quick processor to boot, that is what I chose. Usual problem next, the PC versus Mac debate, I now owned a PC and everything else in the office was Mac based. A quick call and Pocket Mac Pro was deemed to the best possible solution (more about this in the Review of the Loox 720 elsewhere on the website). Needless to say it works. However it is not needed to get Phojo up and running, as it looks after synching iCal, Address book etc. The installation procedure for Phojo could not be much simpler, download a small .CAB file about 1.6mb (which I did from the PDA) via a WiFi network, install and enter the serial number, and away you go. Before you do anything else there a couple of things that need to be done in Phojo before you start using it in anger, firstly do a complete system back up. Otherwise in the event that you have to forcefully reboot you will lose the software install and have to re-do it. So a quick back up (which takes about 30 seconds) is well worth it. Then you can go about starting up Phojo. The first task that needs to be to done is to configure the software, including adjusting your screen output, now I haven’t had my machine very long so I shall be interested in how much difference the ambient light makes. To be honest I wouldn’t be carrying out any colour critical work on the Pocket PC, for that I would shoot RAW and use the Desk Top System in the office. Next up set up the user preferences, which for the most part are fairly straight forward. 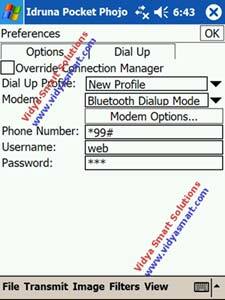 One thing that is useful to know is do not check the Override Connection Manager unless you are using a Canon WiFi (or Nikon) Transmitter, this setting will allow you to maintain two WiFi (or a WiFi and Bluetooth) Connections simultaneously. Having set the preferences you can then start to work with your images. I shall try to describe the process in a reasonably logical progression from inserting the CF card to wiring your images, However the will be (or maybe) little diversions to other parts of the package that you (or I for that matter) will never need. OK first Job is completed and you want to give the Phojo a bit of a workout. Now I was skeptical, I shoot with EOS1DmkII N bodies, which are 8.2 megapixels, giving a 24mb file in Photoshop. Photoshop CS2 with a Firewire CD Card connected and one gig of RAM takes a while to load and deal with any number of images how would this cope? The answer is, surprising (to me at least) very well. You will find that you change the way that you are working, to accommodate Phojo, but it is very well worth the small change. Phojo does have a browse facility so that when you load the CF card you can view all the thumbnails, tag the ones that you want to work with and then edit. The other alternative is to tag the images whilst in the camera and then simply select all the tagged pictures in Phojo (a single mouse click, /pen click). So whack your CF card (or SD card) into the appropriate slot and fire up Phojo. Click on File button at the bottom left hand corner of the screen and a thumbnail preview screen will appear. It generates surprisingly quickly, utilising the embedded thumbnails in the Jpeg files. The small thumbnail view (show left) also reveals the tagged check button to the left of the image (this shows that the image has been tagged, and can itself be used to tag or un-tag an image however it is a little on the small side, and I struggled to get it to work) and the file name and size to the right. Now, one thing to point out is, this is not Photoshop, you will not find tools to blur backgrounds and remove spots from models top lips, or coke cans from car shots. But it is a great image editing and wiring program and has the functions that you will actually need without all the additional bloated code that makes Photoshop great for Photo retouching. Images opened in the imaging editing area and three previously greyed out menu options (when at the front screen, see the very first screen capture.) become available. They are: image, filters, and view. Dealing with the last one, first. Seeing as I have already inserted the screen capture in the page. To be honest this is probably the first option you will also choose. You have the option of changing the view percentages, So I initially I view the image at full screen, to ensure that all the necessary components are in the frame, I then whack it up to 100% to check that the important bits of the image a sharp and and there are no closed eyes in the frame, then off to the one of the other options. So next we Open the Filters Section and start with doing the levels, as good image tweaking practice dictates well will sharpen at the very last minute after all other destructive processes have been carried out. So clicking on Filters and Levels reveals the screen that is shown on the left hand side. You the option of adjusting levels manual, via the slider controls just below the Histogram on the left hand side, and you can also view the changes as the happen in the preview pane, which can also be adjusted using the magnifying glass buttons. When you are done click on the OK button and the window closes, and you have the option of choosing another image filter. I shall not deal with the Colour Correction or Dodge and Burn Options as they are self explanatory and use a very similar interface to the one above. I shall include additional screen shots at the end of the review, suitably labeled for those that are interested. Next up (at least in my workflow) is to the Crop Function, (assuming that I don’t have to rotate the image) So click on Image and the Crop, (see it’s not rocket science this software lark) Like a lot of the other functions in Phojo, this can be entered in a number of ways, you can use the keyboard and enter the height and width and X and Y details, however as usual with these it is far easier just to use the pen (supplied with a PDA) to place and drag and drop the crop square (I just wish to could crop in circles, because then Crop Circles….. I know it is just childish) to the suitable area, a quick double tap (S.A.S. If you get my drift) and the image is cropped. Click OK and then you can move on to the next stage of the image processing. 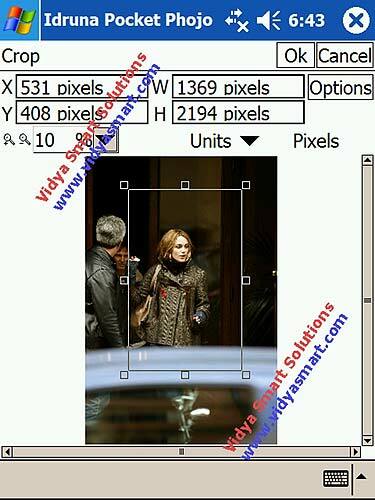 If you are planning on resizing the image, now is the time to do it. Select Set Image Size from the Image Menu and in the available boxes set the new size that you wish the image to be. 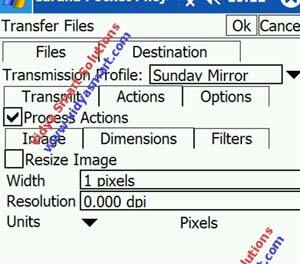 For example if you are shooting on an EOS1Ds at Fine Large Jpeg settings your image will be 3504 by 2336 pixels, if you are transmitting on a flaky 9600kps GSM mobile line you will probably want to compress your image heavily to keep the file size manageable. So Phojo, as well as being able to set the Jpeg compression (which I will touch on later), you can also resize, which is especially useful when dealing with images shot at high ISO’s that will not compress much. 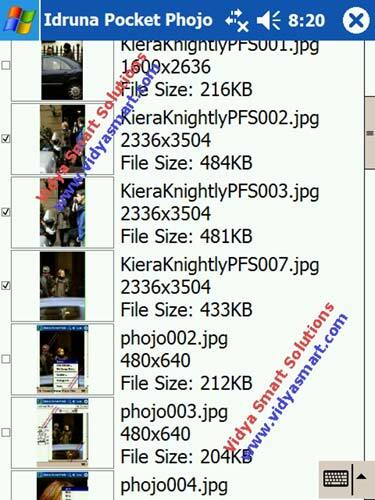 So for example a 3504×2336 image is about 24mb in Photoshop, reducing it to around 2600×1733 means that it is about 13mb in Photoshop, and will compress to a smaller Jpeg file. Now having done all of the destructive image manipulation, now is the time to apply USM (Unsharp Mask). 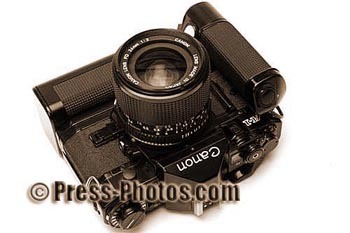 Phojo sharpening applies only to the luminance channels, which yields better looking results. The screen used is very similar in appearance to some of the others that we looked at. Many of you will also recognise the same scales that you use in Photoshop when you are using USM. I would suggest that if the figures you use in PS work, that you replicate them here. I haven’t found a way of persuading the software to remember previous settings, or to predefine levels of USM, they simply revert back to Amount 100%, Radius 1.5 and threshold 0, which isn’t, it has to be said a bad place to start from. I personally prefer to increase the percentage to around 160-170% (file size and imaging chip have a lot to do with the amount of sharpening required. Generally, the bigger the file, the more sharpening required). Again Click on OK and the sharpening is carried out across the image. After the Image is captioned there is not a lot else to do except to wire the pics to your picture desk. 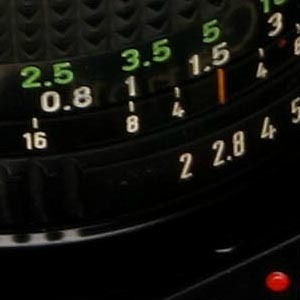 The changes to the images are not applied until the images are saved, and Phojo always applies the sharpening last of all, so the order in which you do things is actually irrelevant. You may just as well work logically through each menu, rather than jump backwards and forwards as I have done. 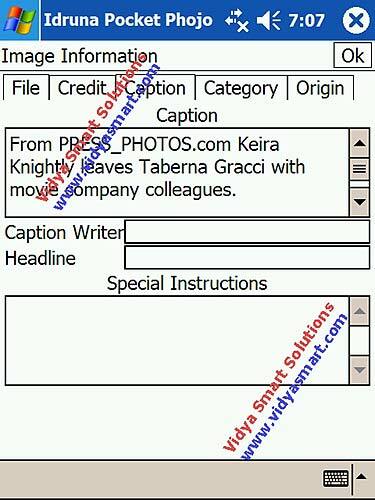 Captioning, as you would expect follows the IPTC formats, and enables you to predefine an unlimited number of captions . ( I assume subject to having enough free memory to store them). 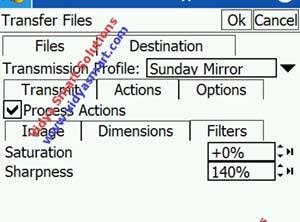 The format of the screens is fairly similar to the Photoshop Methodology, fill out the form, save it as a template, or alternatively you can make it a default, so that when ever you wire an image automatically, you cannot forgot to at least have your minimum contact details in the caption box. As you can see from the image (right) that there are five tabs at the top of the screen, clicking on each one of these takes you to the relevant section, where you fill in the appropriate details. Now the nitty gritty, having used your built in PDA software to either link to a convenient WiFi network or Bluetooth Mobile Phone to the GPRS (GSM whatever!) network you can use Phojo to wire either via FTP or Via Email. Don’t forget that at the moment we are just working with a single image, it will all get a bit trick later on (by trick I mean clever, not difficult). 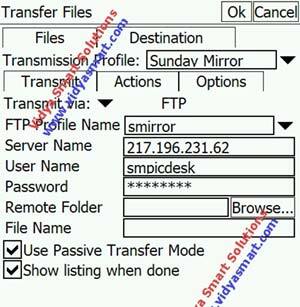 So click on the transmit option at the bottom of the screen and choose the Send Via Email, or Send Via FTP, I have chosen FTP for my example, (Hell, I am not going to tell you how to do everything). 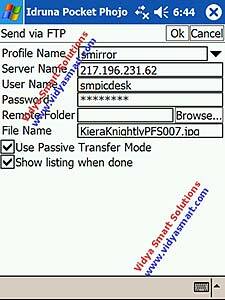 Choose the profile that you are going to use (this includes the destination details, including Server Name or (IP Address) Username and passwords, you can even specify a folder on the FTP server to copy the files to. You can also if you want change the file name on this screen, and also the FTP mode. The system will then wire the image to the destination, so but you PDA in your pocket and have a cup of tea, or take the CF card out and shoot some more pictures, whatever it is that floats you boat. Now we are going to have a look at what really makes this an impressive piece of software. (as if image manipulation and wiring in a single package occupying less than a couple of MB of disk space wasn’t enough. Damned this bit is going to seem more involved than it is, it is actually easier to do it than it is to describe. But I shall give it a go. Just for you. The Process OK the set up is similar to last time, except that instead of selecting a single image, we are going to select all tagged images, we are going to apply a standard caption, Sharpen and various other bits and wire them without lifting a finger (well, not many fingers). Boy you are going to love this. I shall mainly let the screen shots do the talking, but I know you’re going to like this. This is ONE of Phojo’s party pieces. The final screen dictates a few other options. 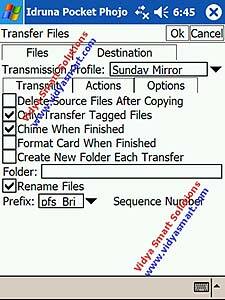 Once this has been set up, it will always be available, you set up one transmit folder, but have multiple profiles (one for each client) and then away images go, you only need to edit one or two elements (usually the caption content for the job and that is it. Now it’s other party trick is if you have a Nikon or Canon Wireless Transmitter, you can set the WiFi transmitter to transfer tagged images to the PDA, the Phojo software will watch a pre-set folder (where ever you a going to save the images to) and as an when a new image arrives in that folder automatically wire it according to the profile set. So without taking the card from the camera, or indeed the camera from your eye, your images are being wired to well wherever you want. 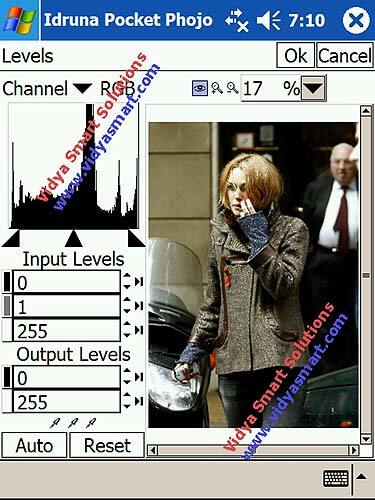 I personally have thoroughly enjoyed using the PDA and Phojo software, and I can see it being a major advantage to the lone operator, up against a Tog and a wireman at a Red Carpet Bash, whilst his captions may not be as detailed, he should be right up there with the speed. As many of you know, being good sometimes isn’t enough, sometimes you have to be first as well. In the field I am impressed, with nothing else running on the Loox, drop a CF card in the slot with 5 images tagged for wiring, within a second or so Phojo starts working, within 5 seconds the first is opened and being worked on, within 20-25 seconds the image is being FTP ‘d to the server of you choice (this obviously depends upon the actions you are performing.For the test, Sharpening (140%), Compressing (34%) and Captioning). Dependent upon the speed of your connection, the images then race their way (via WiFi, GPRS, GSM whatever you are using) to the server. The great thing is, this happens without user intervention, once you have set the initial parameters. I have a profile set for my main clients (you can set up as many as you like) and the images by default get sent straight there, no messing about. Here are two images, both from the original source file, one was phojo’d and the other photoshopped. the only difference is the sharpening that has been applied, in Photoshop I have been a little more aggressive, but seeing as Phojo automates the process (to the extent that there is no user involvement required, it is probably better to be a little less aggressive, especially as the screens on PDA’s aren’t really good enough for extremely detailed work. These are 300 by 300 pixel crops from the image below. There are a number of new features available in the latest release and a number of others due to be added. This review will be updated soon to include the latest functionality.